I love presenting. Standing in front of an audience fills me with adrenaline and calm at the same time. The adrenaline comes from fear and excitement. The calm comes from a sense of mastery. Here's how to get that calm. Get a ton of practice. Public speaking is a learned skill, even for those with natural talent. Find as many opportunities - professional or otherwise - to present. Make a toast at dinner. Get up at karaoke. Experiment with the same content in different contexts, for different audiences. I started in poetry slam, which was wild, ruthless, and a killer training ground. I learned to give talks in good rooms, lousy rooms, rooms full of drunks. When I switched to professional speaking, I already knew it takes a lot of practice to hone a talk. It's not uncommon for me to give the same talk 50 times in a year. Each time, it gets better. All that practice helps, a lot. Develop a meta-narrative for your presentation. What's the big idea or story? Is there a way to express it in a simple metaphor, image, or phrase? If possible, do that--and then repeat, layer, and deepen it throughout your talk. Consider using Marshall Ganz's Public Narrative technique. This is a formula that starts with a story of SELF, then a story of US, then a story of NOW. It's a great format for sharing your vision for a new initiative or desired change. I've recently started using this model and I love it, especially when I want to quickly focus people towards a call to action. Keep it short. Length is not your friend. Audiences respond better to short talks, and you'll have an easier time staying focused on presenting well. Try to create a 5 or 10 minute presentation, even if you are offered a longer time slot. It will clarify your thinking and tighten your focus. I learned this from doing a couple TEDx talks. Each time I've done one, I've been forced to revise a 60-minute talk into 12-18 minutes. It's ruthless and hard, but once I'm done, that short talk is a clear, powerful anchor--which I can then expand upon as needed. Find your own best way to get intimately familiar with your presentation. I take the approach of scripting the broad "moves" in the presentation but not the specific words. Others prefer to script the words and memorize. Figure out what works for you and then don't take any short cuts! You want to be at your most confident when presenting. Cultivate stage presence. Your authority as a speaker starts before you open your mouth. Practice a few simple things to establish presence as a speaker. Plant your feet before you start. Pull your shoulders back. If there's a microphone, hold it close. Make eye contact. Trust that if you pause, people will wait and listen. You will know you have presence when you can step up to a mic and people turn naturally towards you because something about your actions made them expect you to speak. Start strong. People decide whether to tune in or not in the first 15 seconds. Lead with a bold statement or a story. Do NOT start with a long lead-in or apology for what you are about to say. Pay attention to the sound of your words and pauses. You don't have to be Shakespeare to throw in some beautiful phrasing, rhythm, and images. Pauses are powerful too. Small theatrical touches will bring your audience pleasure and increase their interest in your talk. Give the audience room to participate. Even if your talk is not interactive, make sure to respect the time and space your audience needs to understand and react to your words. If you tell a joke, give a pause for laughter. If you drop an intense idea, give a pause for consideration. When you rush from one sentence to the next, you don't respect the time and space your audience needs to fully connect with your words. Use slides as a springboard, not a lifeboat. There are a million ways to use visuals in your presentation. I mostly use single images, occasionally punctuated with a bold statement or quote. But the most important thing is not which images you use but how you use them. Think of the images as complementary to your talk. They should add depth and reinforcement to what you are saying. Don't read your slides. Don't look to them as a lifeline. Focus on your audience, and have faith that your words and images will come together to create a powerful message. 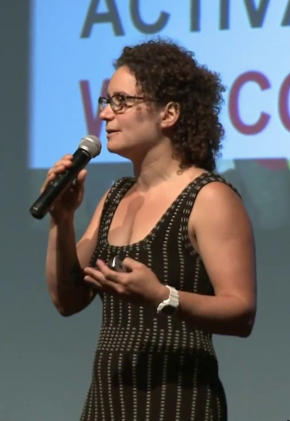 What tips have helped you most as a public speaker? p.s. I'll be speaking this year at RevitalizeWA, MuseumNext, and Next Library... I'd love to see you there! It's late in the afternoon. I'm cranking away on a grant proposal, when suddenly, a classical rendition of "All the Single Ladies" wafts up the stairs. In the office, colleagues lift their heads. "Is that...?" someone asks. "Yup," another nods. We grin. This is the magic a piano in the lobby makes. We've now had a piano in the MAH lobby for several months. About once each week, a visitor walks in and blows everyone away. Sometimes it's a homeless person. Sometimes a lover's duet. This week, it was a little guy, attended by a stuffed toy on the piano bench. It's rare that someone sits down to bang out noise. 95% of our piano users play music, beautifully. 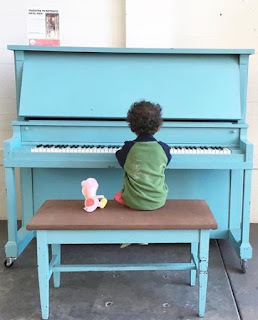 The piano is a simple invitation to meaningful visitor participation. The activity is clear and well-scaffolded. The outcome is open-ended and visitor-driven. It invites visitors to make the museum better. When visitors share their brilliance, it brings the museum to life. I believe that every person who walks into our museum has something valuable to share. A creative talent. A personal history. A special skill. It's not their job to present their abilities to us. It's our job to welcome them, invite them to contribute, and give them the tools to do so. 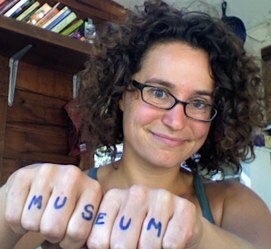 This is the participatory museum, played out loud.